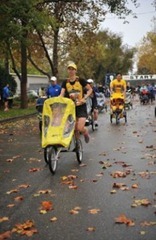 This is our last stroller race together. It’s bittersweet for sure. Today is going to be tougher since there is rain and some wind. Ariel is nice and cozy under the hood of the stroller. We see mother-and-son team of Leonie and Reed Alesci. We see our big competition…a grandpa and grand-daughters team of Dave Campbell, Isabella & Rachel. We all chat and hang out. The race is getting a late start and kiddos around us are starting to melt down. Mile 1 is 6:38. I’m happy with that and that we are the first girls. Dave is ahead and I’m trying to keep the gap as short as possible. He’s moving closer to the first guy and I want to shout “catch him” but he’s too far away to hear me and I don’t have the energy. I figure he’s thinking the same thing. Dave makes it to the next turn way before me. By the time Ariel and I make he turn, he’s out of sight. It’s getting tough to keep up the effort. Lord, please help me hang on. Mile 2 is 6:43. Ariel and I are holding onto 3rd. Soon we are heading South right into the wind. Ugh, this is tough. I see Dave briefly and he’s really close to first! I know he can do it! “We’re almost done Ariel!” We make it to the final stretch…the 2nd longest section of the race. 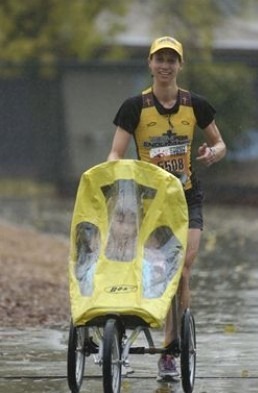 The wind is strong here and I push my legs and the stroller as hard as I can. Thank you Lord for helping me…I know You’re with me! I can see Dave in first in the distance. Yeah, you go Dave! Mile 3 is 7:02. We are still in 3rd and the first girls! Don’t quit! I give it what I have. Ariel and I roll across the finish. Yeah! I’m so happy that Ariel and I were able to do this one last time! What a great race! It's a rainy day but we're prepared. We've done this race for 6 years now. This year is special because it's Robin's last time doing the Baby Jogger 5k Race. Even though the drizzly morning is drawing a small crowd of moms and dads pushing baby joggers, it is still a heated race as Robin and our friend, Dave Campbell, are ready for their re-match from last year. It's definitely the main attraction for me and the girls. Anna & I cheer them on as they race off into the wind and rain. We cheer on Leonie Alesci and little Reed, too. Then I realize I have a race to do myself! I almost forgot. Rich is nice enough to watch Anna as I rush off to get ready. I take off a lot of layers leaving tights, long sleeve shirt, knit cap, and gloves. I've been a little sick lately so opted for the tights which I usually wouldn't wear in rainy weather. I say a quick prayer, knowing my real hope for a good day always lies in the Lord rather than my body. We're already pretty wet standing at the start. I'm 3 rows back. I see a triathlete-looking Forward Motion guy right on the start with almost a sprinter's pose. On the count down, "3..2..1", the rest of the line goes on "1" whereas the FM guy waits patiently for the "Go". Ironically funny that the calm runner-guys jumped the gun like triathletes often do at the swim start, whereas the high-strung triathlete-guy waiting for the actual start like runners are good at. We're off! Rich is cheering and Anna gives me a high five. 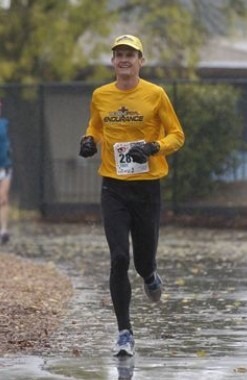 Not knowing what I can do after being sick, but not wanting to sand-bag, I set my goal pace at a 40min 10k… 6:27. After the 1st 2 corners, I can see what looks like 1/2 the field already ahead of me. That's ok, I know it always looks better at the finish line. I slowly pass a guy carrying his son on his shoulders. I tell him that's amazing and he says it's probably the last year as his boy is getting too big. 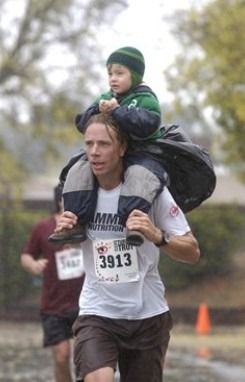 He started out at 6min pace.. with a kid on his shoulders.. even with a jogger that would be hard. Now I notice a few women stretched out ahead of me and try to work my way up. I'm pretty wet but the temperature is good. And the wind is behind us. I'm feeling ok.
Mile 1: 6:21. Great. But it will be harder coming back in the wind. I'm already realizing that the tights weren't needed. Despite rain, legs always get warm. Mile 2: 6:24. Good. But with a tail wind. Now we hit the trails in the green belt. I'm breathing pretty hard and the pace is difficult but I try to make up for it by running smart.. taking every inside corner.. using my arms.. looking ahead. I pass some people and some pass me. Mile 3: 6:32. I felt like I was pushing at the same speed but this is showing that something's giving way. I'm about 10secs off pace but I'm still optimistic that I can make that back up in the last mile.. as long as I can keep 6:27 pace for the next 2 miles. Mentally it's a good course with all the curving, tree-lined paths. Sometimes you can see runners ahead going different directions… it keeps you wondering where the final straight-away is. Mile 4: 6:39. Reality hits. 20 secs is a lot to make up in the last mile but the real problem is the pace is getting slower despite my efforts. Ok, don't focus on the pace, just keep trying, breathe deep, and get excited for the last mile. At the 5 Mile marker I'll even slow down just a bit before I psych up and give it my all for the last part. I'm hurting but I don't give up hope. You never know what might happen. The wind is in our face. 2 guys pass me. There's a downhill coming up through a subway. Despite the pain I surge forward to get into their draft, go all the way through the tunnel and then watch as they pull away on the uphill. It was a good effort. Little things to be proud of. Mile 5: 7:07. Oh boy, I didn't realize the wind and fatigue was doing that much damage to my pace. The 40min goal is out the window but I don't think about how much, I just smile, slow a little, and then turn on the big push for the last mile. Unfortunately, my big push, isn't changing the pace. There's just nothing there. Wow, it's the like the body is on autopilot now getting ready to slow and land. But I keep the pedal floored. There's an overpass. Oh, the uphill hurts. But now it's down.. onto the street.. and there it is.. the long straight-away. Just go to my happy place.. the finish will be here soon and I'll be happy. Thank you Lord for getting me this far. Done! 41:49. That was tough and I can only imagine how much tougher pushing a stroller, let a lone a DOUBLE-stroller that Dave is pushing. I found out Robin did great and Dave actually won overall. Leonie also did great. Thanks Lord for a good day! I may not have won but it was a winning effort.